Turkish media outlets have published CCTV images which they say show the Saudi intelligence officers allegedly behind the disappearance of Saudi journalist Jamal Khashoggi. The images, published by Turkey's Sabah newspaper — an outlet close to the government — have not been verified by NBC News or Euronews. Khashoggi, a Saudi journalist critical of the ruling royal family, was last seen entering the Saudi consulate in Istanbul, Turkey, on October 2. Turkish authorities have accused Saudi Arabia of killing the journalist, a claim they deny. The footage released on Wednesday shows Khashoggi entering the Saudi consulate as well as images of black vans driving to the building. It also shows groups of men arriving and later leaving Istanbul airport, as well as checking-in to a hotel. Local media claim the men are part of a 15-strong hit squad, sent by Saudi Arabia, which includes special forces officers, intelligence officials and a forensics expert. Khashoggi, 52, is a contributor for the Washington Post who has been living in self-imposed exil in the US. His critical reporting of his native country saw him fired twice from his role as editor-in-chief of Saudi's Al-Watan newspaper. A television channel he was in charge of was shut down after only 11 hours on air in 2015. What is Turkey and Saudi Arabia saying? Turkey blames Saudi Arabia for Khashoggi's disappearance and affirms the writer never left the consulate. Saudi Arabia denies those allegations, saying Khashoggi exited the building shortly after his business there was conducted. The journalist went there to finalise his divorce so he could marry his fiancée, Hatice Cengiz. The country's ambasador to the US, Prince Khaled bin Salman al-Saud — brother of Crown Prince Mohammed bin Salman — described the accusations as "completely false and baseless". The country has indicated it would allow Turkish authorities to carry out a search of the consulate. The US and the UK have both called on the Saudi government to step up its investigation into the disappearance. "We call on the government of Saudi Arabia to support a thorough investigation of Mr Khashoggi's disappearance and to be transparent about the results of that investigation," US Secretary of State Mike Pompeo said in a statement on Monday. Jeremy Hunt, Britain's Foreign Secretary, met with the Saudi ambassador to the UK on Tuesday "to seek urgent answers over Jamal Khashoggi". "Friendships depend on shared values," Hunt warned Saudi officials in a tweet. Reporters Without Borders also called for an "independent international investigation" to be conducted in a statement issued on Wednesday. 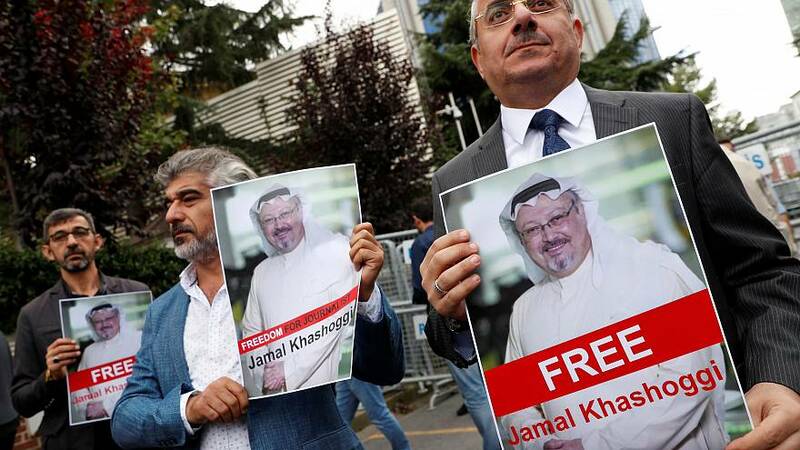 "His disappearance has come amid a particularly harsh and opaque crackdown on Saudi journalists and bloggers," the charity and press freedom advocacy group said.